9,255 others viewed this post. I almost forgot to post this I’d been agonising about it for so long, processing and reprocessing, learning something new then reprocessing again! I collected this data last month and it’s not a lot (about 1.5 hours worth) but since it’s the biggest and brightest thing in the sky, it doesn’t need a very long exposure time. 4 times larger and brighter than Orion, Carina is the jewel of the southern skies. It’s so big most telescopes can’t fit it all in, and even my widefield Hyperstar at 540mm zoom doesn’t fit it all in either. The core is striking though, bifurcated like some others (eg Triffid, Rosette) by the star formation occurring in the dense centre region, and energised by the bright Eta Carinae star system which itself is unique and bizarre. 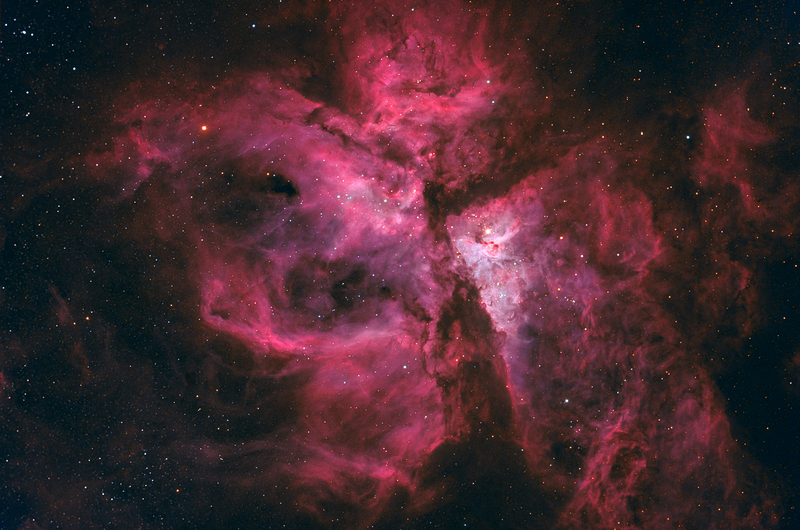 A mix of Ha and RGB captured with a colour CCD camera, the colours are natural but strengthened. It’s easy to go too red or too bright with this one but it’s really more of a purple / pink / salmon colour like most emission nebula are. I’ve been quite active and have posted a bunch more things to deography.com, and started a new website for the minor astrophotos I collect between the “major” projects like this one. You can see them at www.byronbayobservatory.com.au which also collates the writing I’ve been doing for Celestron and Photographing Space.